I was watching a Next Food Network Star rerun the other day and got a good laugh out of Wolfgang Puck bringing one of the contestants back inside the house to show her how to make risotto. I am sure many of you saw this episode too. I was amazed that a person would make it that far on a show like that without knowing how to make risotto! I guess that shows that TV is not always as realistic as we may think. Come to think of it, I also watched a 24 Hour Restaurant Battle where the girl who was going to be the head chef had never even worked in a restaurant before! Anyway, I love risotto because it is much creamier than regular rice; it kind of reminds me more of grits or mashed potatoes. Although it is important to know the correct way to make it if you want it to have the right consistency. The keys to making risotto are adding a little bit of hot liquid at a time and lots of stirring! This specific risotto is so flavorful. Thanks for Herbivoracious for the idea! It has a tangy taste of roasted tomatoes paired with a creamy (and a bit spicy) taste of the green chile goat cheese. If you are not a spice person, you can just use regular goat cheese. Cut the tomatoes into halves and roast at 375F on a foil-wrapped baking sheet until soft (about 20-25 minutes). Reserve the run-off liquid. Peel the roasted tomatoes and place in a small amount of olive oil while finishing the risotto. NOTE: These can be made a day ahead and kept in the fridge. To make the risotto, set aside 4 roasted tomatoes and the tomato oil, then blend the rest in a food processor until a pulp is formed (about 1-2 minutes). Next, pour the oil off the reserved tomatoes into a pot and heat over medium heat. Meanwhile, heat chicken broth and 2 cups water in two separate pots. Add the onions and sauté until soft, but not brown (about 3-5 minutes). Add the rice and stir until lightly golden (about 2 minutes). Add the white wine, tomato pulp and salt. Stir until the liquid is almost completely absorbed (about 3 minutes). Add about ¼-1/2 cup chicken broth at a time, stirring frequently, until liquid is absorbed. Repeat until the chicken broth is used up. Once the chicken broth is used up, switch to the hot water. Check the rice after every liquid addition is absorbed. Once the rice is almost ready, add the corn. Continue to cook until rice is cooked to desired level. Once the rice is creamy, starchy and cooked through, remove from the heat and add the goat cheese and stir until melted and creamy. Split into individual bowls and top with the reserved tomatoes, parmesan cheese and thyme. I am a big fan of risotto also and it does take some patience to make,but well worth it. The additions of goat cheese and tomato on top sounds and looks delicious. Great post! Very nice! It seems goat cheese is very popular these days. I see a lot of recipes using it lately. I remember a few years ago when I first came across asiago cheese. Now it’s very popular too. I LOOOVE that show! That was a great moment… and this risotto sounds absolutely delish! I love risotto! I’ve made mushroom risotto many times but I’ve never thought of a roasted tomato one! Sounds (and looks) delicious! I had me with the green Chile goat cheese! Love it! What a great looking risotto!!!! I was on the same wavelength watching Food Network Star. Wasn’t it funny how Bobby put his head in his hands when Wolfgang headed for the kitchen? This sounds like a great recipe!!! Love green chiles! I love risotto! I watched the first season of TNFNS and after it was done I quit the channel altogether. I really liked the network for the chefs that taught me how to cook properly. I don’t need to be watching someone like me; someone who just likes to cook; who has the charisma, grace under pressure and ability to be on television. Anyhow, sorry for the rant. 🙂 Your risotto is beautiful. I love tomatoes and with as many as I have from the garden, I can’t wait to make this. Beautifully done – I agree….if you’re going to be a foodnetwork star – you should know how to make risotto! Wow this risotto looks amazing! Love the combo! This risotto looks fabulous! I usually make mushroom risotto, but I definitely need to try this roasted tomato & goat cheese combo! 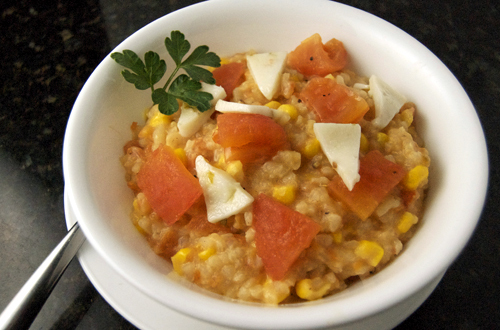 Flavorful Risotto..I love the ingredients that you used!! Goat cheese + roasted tomatoes = I’m in! Thanks for the detailed instructions on making the risotto. I am looking forward to trying this as my cherry tomato plants are gearing for a tomato explosion any day now. I saw that episode of TNFS star too, and was so surprised (and slightly embarrassed) that she didn’t know how to cook risotto! It is actually one of my favorite things to eat and make, but I’ve never tried it with goat cheese…I think that’d only add to the already great creaminess of risotto! As a northern Italian I consider myself sort of a risotto expert 🙂 Just kidding! though I’m definitely a risotto fan. 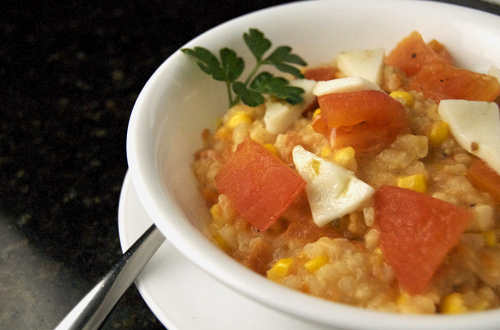 Goat cheese and roasted tomatoes give risotto an interesting spin while keeping a solid base of authenticity. I’d like to try it! Oh poor Jill, I don’t think she ever really recovered from the Wolfgang bit. But she really should know how to make a proper risotto. This looks like just that, thanks for sharing!